A bar may have traditionally been a place to eat handfuls of peanuts while nursing a beer, but the modern-day bar has added a menu of traditional pub food to please the hungry consumer. If you include some of these popular pub foods at your bar, y our customers will thank you and your liquor sales will increase. Finger food appetizers like fried mozzarella cheese, loaded nachos, potato skins, French fry baskets, onion rings, and dips are great for a bar because they represent a fairly inexpensive way for customers to snack on something while they enjoy a cocktail or beer. For example, to introduce French fries to your menu all you would need to is a French fry cutter a sack of potatoes and a fry pot and you are good to go. Adding these items to your menu is also likely increase the amount on your customer's drink tab as well. It is almost impossible to have a bar menu without including at least one burger and French fry pairing. 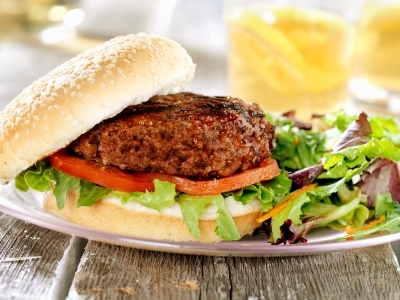 Burgers are inseparably linked with beer, so adding a high quality, traditional burger to your menu is a great idea. One of the most popular pub foods is chicken wings. This menu item is so popular, in fact, that it has spawned the creation of restaurants that are built entirely around the concept of consuming flavorful wings with beer and cocktails. Buffalo wings, of course, are the most popular tyoe of chicken wing, and it is difficult to find a pub that doesn't offer this option on the menu. You can add different chicken wings, like barbecue or garlic wings, to the menu for greater variety. Pizza is one of the quintessential menu items for a successful pub. The concept of pairing pizza with beer is ingrained in many customers' minds, and a menu that doesn't have at least one Italian pizza pie will seem empty to many customers. The pizza doesn't have to be complicated or extravagant. A simple meat pizza or vegetable pizza will often suffice. You can offer pizzas in different sizes, or create a house pizza that is easy to share among a group of friends. The key to good pizza is the perfect combination of hearty crust, flavorful sauce, lots of cheese, and high quality toppings. Some pubs have taken to offering Mexican-style dishes along with the traditional pub food offerings. This provides customers with a different option for eating, and many customers like to pair Mexican dishes with drinks such as Mojitos and Margaritas. Common menu items with a Mexican flair include chips and salsa, loaded nacho plates, and quesadillas. The trick to serving Mexican food in your pub is to bring the food out hot and use a lot of flavor. Because alcohol dulls the senses, all of the flavors used in your salsas, cheese sauces, and meat should be kicked up a few notches. A high quality pub is the perfect hangout for men and women who simply want to relax after a long day at the office. While some bars only offer cocktails, beer, wine, and other beverages, with some snacks, most bars are taking the pub route and offering a limited menu of comfort and indulgent foods that pair excellently with the drinks served at the bar. Bar owners are realizing that customers who purchase pub food are also likey to purchase more liquor, so a direct increase in liquor sales occurs once pub foods are introduced.